Since the Black Lives Matter movement started in 2013, police violence against black people has come under intensified scrutiny. In Chicago, a city notorious for police brutality, the police have killed 62 people—47 of them black—between 2013 and July of 2017, according to Mapping Police Violence. Organizers and activists in Chicago have taken up various approaches to confronting police violence, from protests to community art projects. Now, the local artists and activists who make up For the People Artists Collective are using art to address a century of police violence in Chicago in their new exhibition, titled Do Not Resist? For the People is a “radical squad of black artists and artists of color” that creates visual art in support of local activist efforts, many of them directly pertaining to police violence. The Collective is situated within the abolitionist movement, a radical position that aims to completely replace violent and repressive state policing and incarceration with community-centric solutions for justice and safety. Do Not Resist?is just one piece of For the People’s work to reimagine safety in Chicago. The collective was instrumental in the 2015 #ByeAnita campaign in Chicago, which contributed to the ousting of former Cook County State’s Attorney Anita Alvarez. Many Chicagoans harshly criticized Alvarez when she took more than a year to charge Jason Van Dyke, the police officer who shot 17-year-old Laquan McDonald 16 times in 2014, killing him. For the People created posters, banners, and a ‘zine as part of a successful campaign that called for citizens to vote Alvarez out of office. In 2016, Alvarez lost the Democratic primary for state’s attorney to Kim Foxx, who became the first black woman to hold this office. More recently, For the People helped spearhead another local activist campaign targeting the city government for allocating $95 million for a new police training academy in West Garfield Park, a neighborhood on the city’s south side. The alderman for Chicago’s 35th ward, Carlos Ramirez-Rosa, has argued that Mayor Rahm Emanuel is also using the academy strategically, for the purpose of gentrifying the West Garfield Park. “A big factor in gentrifying this area of the city was the placement of the police academy in that location,” Ramirez-Rosa told the Chicago Reader in December of 2017. Ramirez-Rosa said that the city’s next step in gentrification will be to sell old training facilities to developers, and repeat the process with the new academy in the years to come, displacing black residents in the neighborhoods. Meanwhile, Emanuel is closing public schools that primarily serve black and Latino communities, and therefore students, their families, and local activists have criticized the decision to fund the Chicago Police Department to the detriment of public schools. 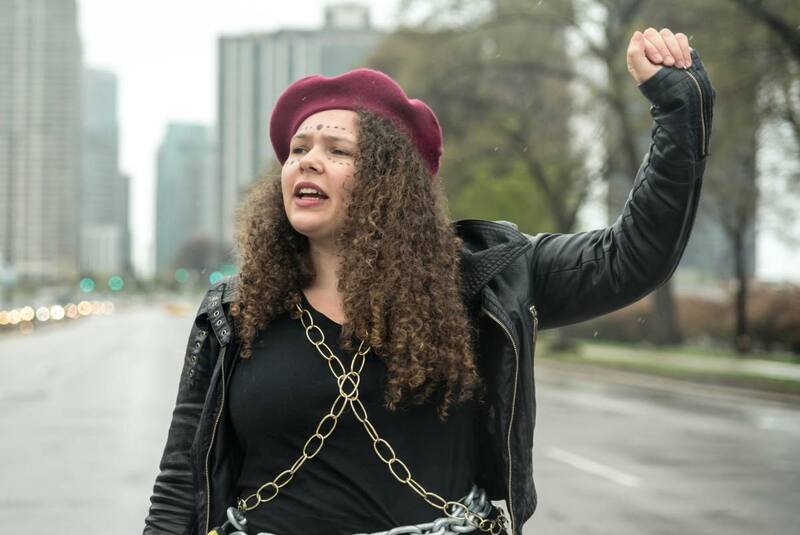 Led by Assata’s Daughters, a collective of radical black youth and adults, and supported by a coalition that includes For the People Artists Collective, the #NoCopAcademy campaign has organized and galvanized Chicagoans against the new training facility. The decision to add nearly $100 million in new police spending while shuttering public schools is especially egregious in light of a recent Department of Justice reportthat detailed widespread civil rights violations within the CPD. Police violence in Chicago far predates the Justice report, however, and this long history of state harm is the subject of Do Not Resist?, which addresses the last 100 years of police violence in Chicago through paintings, stained glass, photography, and interactive exhibits spread through four galleries around the city. In an interview with Pacific Standard, Ruby Pinto, a member of For the People and a curator of Do Not Resist?, discussed the collective’s activist work, the role of art in liberation struggles, and how the Collective wants the exhibit to inspire audiences to think creatively about community safety. What was the inspiration for Do Not Resist? What does the Collective hope audiences will glean from the exhibit? Mariame Kaba [an organizer and founder of Project NIA, a non-profit focused on youth decarceration] is a huge influence on our collective—she has done a couple of art exhibits about the history of policing, of racist imagery and violence toward women. She uses art exhibits as a chance to address the problems, but also as a chance to propel toward action. And you know, we wouldn’t consider our exhibit to be successful if we didn’t have ways to engage people afterwards. The goal is not to just get you to feel something, the goal is to get you to do something. We want to articulate that this is not a new problem, and even if we take just the past 100 years here in Chicago, you can see countless examples of how the state has enacted violence upon citizens. We want to depict not only the history of police violence, but also the history of resistance to that violence. From the labor movement to the Black Panthers to queer people rising up in the ’90s, there has been a strong current of resistance here in Chicago. The goal is not just to be upset and sad about the situation that we find ourselves in, but also to highlight the city’s rich history of resistance. Can you speak about how both the exhibit and the Collective aim to address the underlying system rather than necessarily focusing on individual heroes and villains? For the People Artists Collective has the goal of prison and police abolition. We operate from the historical perspective that the police and prisons have evolved not in an effort to keep us safe, but in an effort to control us. [These institutions] evolved from place patrols and Native American hunting squads, and we want to be honest about that history. When you look at the history [of prisons and the police], you can’t be surprised at how violent they turned out to be. Prisons and the police do not exist to keep us safe, and the collective believes we need to have a broader conversation about what safety really looks like for our communities. So with all of our artwork, whether it’s working on a commission from a non-profit, working with a campaign, or personal work as Collective members, we keep an abolitionist perspective and a holistic approach to justice. What is the role of art in transformative justice? What I see is a need for creativity in general. It takes a lot of creative thought [to solve problems of injustice] because our culture doesn’t present us with options that work for everybody in our society. Art allows us to communicate how we feel, and to think about the solutions. Art can also help young people understand transformative justice, and also helps people who have a punitive mindset when it comes to seeking justice to break free of that and explore other options. What can art say about state violence that other media, such as journalism, cannot? What do you imagine Chicago would look like without police? How would the city change? It would look like a totally different approach to resource distribution. It would look like housing for everybody, which the city can certainly afford [but instead prioritizes gentrification in black and Latino neighborhoods]. It would look like public schools that are well-funded, students who are well-fed and well taken care of. Currently, the largest mental-health facility we have is our jail, and that’s absurd. It would look like real investment in mental health care and public health. There are just so many things that I can’t even imagine because the basics would need to be covered first. Until we get a firm grasp on the value of human life and realize that we absolutely need to invest in communities, especially in our children, I can’t imagine much past that. *Update—January 12th, 2018: This story has been updated to reflect Johannil Napoleón’s full name.